Once upon a time, there was a wandering tribe of Thunder Warriors looking for a place to call home and quit the nomad life. After long months of traveling and traveling, they found the perfect location - a mountain, a high rocky mountain on top of which they could reach into the clouds and summon big Thunderstorms! However, there was a problem: The mountain wasn’t uninhabited. A group of Water monsters, led by Frostbite and White Walker had lived there for centuries, and they were not willing to share or give up their home… so a war started. Frostbite and White Walker had an advantage: they knew the mountain like none of the Thunder warriors did. For months, they created barriers and glaciers that successfully stopped the tribe from climbing to the top of the mountain, but then the youngest warrior in the tribe decided to make a move on his own: His name was Babari. He snuck up the mountain without making any noise, he reached the top, and he summoned the biggest Thunderstorm ever seen, destroying all the barriers and glaciers instantly, so quick that White Walker and Frostbite didn’t have any time to react and put up new walls. By the time they started trying, they had hundreds of warriors running to the mountaintop and, from that strategic point, they were invincible. These Water monster had no choice but to surrender and leave the mountain. Babari became a clear leader for the tribe, something like a king. He built himself a palace in the clouds, and he started a family there. He had a girl, Zyla, and she inherited her father’s skills for strategy and combat. Then one day, after many years of peace, a new conflict started. Warthak and his clan of chaos dwarves set eyes on the mountain with the intention of conquering it. To start the war, they hit Babari where it hurt him the most: They kidnapped Zyla, but on that same day, Babari was summoned by the other Warmasters to join the fight against the Titans. He had to make a tough decision and leave the mission of rescuing his daughter and defending the mountain to the rest of his tribe while he fought for the big cause of defeating the Titans. Babari and the other Warmasters won their war. However, the Thunder Warriors weren’t as lucky. They managed to find Zyla, but when she saw her father wasn’t there for her, she was so angry that she refused to go with them and she sided with Warthak. With Zyla as a rival, the Thunder Warriors had no chance of winning against Warthak. They lost their mountain and Babari’s palace which now belongs exclusively to Zyla. What new tricks do you think Babari has brought back from his war to be able to defeat Warthak AND his own daughter? And how is he going to win Zyla’s love and loyalty back? Babari is a Thunder Attacker with an area trait that makes his entire team immune to all Torture status effects! To take his protection further, he casts a Damage Mirror at the start of the battle and he also has a Damage Mirror skill, but remember... he's an Attacker, a very good one! He has extra turn skills that can Blind or disable an enemy's trait. 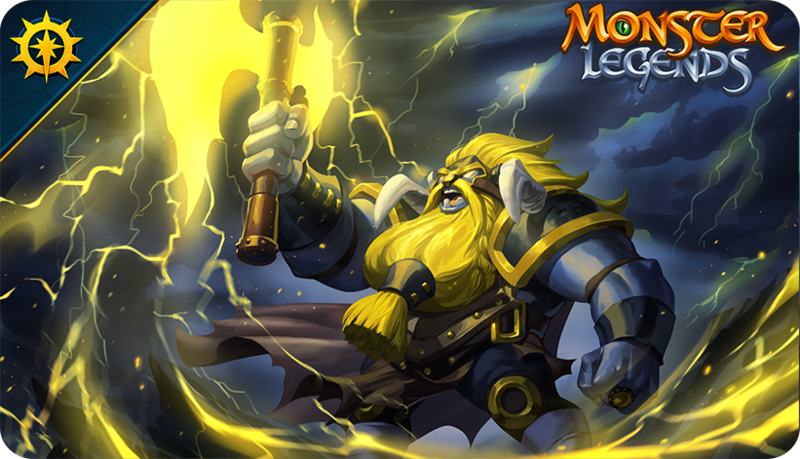 He can apply Shock to his enemies, damaging and preventing them from using extra turns! His Water Hater and Thunder damage skill will evaporate Water monsters!